Read my new post over at Think Markets, on scientism. Accepting the Idea of a General Glut: A Heresy? making our oven mitts? Because every time I try to buy a pair they either have no thumbs, or thumbs in the middle of the palm, so I'm thinking two alien species are exporting these here for us. Third, and perhaps most importantly given the goals of the SDAE, Leeson makes an important contribution to the growing literature on the 'economics of anarchy.' This area of research attempts to understand how order can emerge in the absence of a formal state. What mechanisms facilitate interaction and cooperation where formal rules and regulations are either non-existent or dysfunctional? The power of Leeson’s analysis is to illuminate some of the mechanisms creating order where we would least expect it to emerge. Pirates, of course, were criminals—they stole from others and relied on violence where necessary. Given this, it is logical to assume that the anarchy in which pirates operated was disorderly and chaotic. In reality, however, pirate behavior was orderly and cooperative. Cook ziti per package instructions. Saute carrots, onion, and garlic in olive oil. Sprinkle with Italian herbs and pepper. Once the carrots are softened and the onion translucent, stir in tomato paste, bullion cube, and half a cup of boiling water. Mix to make a thick sauce and then turn off heat and cover. Rinse cannellini to remove mucus-like liquid that ships in the can. Combine sauteed vegetables, pasta, turkey, tomatoes, and beans in casserole dish. Spread cheese out across top, then cover with foil. Bake for 35 minutes, then remove foil and bake 10 minutes more. I recenty ran across, for the umpteenth time, a comment thread where some left-leaning person was saying, "Conservatives actually believe you can INCREASE government revenues by LOWERING taxes." Now, if there is some conservative who thinks you can always raise revenues by lowering taxes, they are obviously nuts. (If the tax is at, say, 1%, you cannot get more revenue by lowering it to 0%.) But if some liberal thinks you can never increase revenues by lowering taxes, they are every bit as nuts. Essentially, the latter position involves the belief that price has no effect on demand. An nice example of a case where raising a tax caused revenues to plunge is the Smoot-Hawley Tariff. Now, whether Arthur Laffer was right that, in 1980, taxes were high enough that lowering them would increase revenues is an empirical question. But the notion of the Laffer Curve, meaning that there is some level at which a decrease in taxes will raise revenues, is a simple matter of economic logic. the most crude caricature of economism on the part of an economist you wish to make up. with the new McRib commercials? It looks like the people on screen are enjoying a nice diarrhea sandwich. My daughter was watching a cartoon with some space alien monsters in it. The brown one with three eyes said to the two little ice-cream-cone monsters, "Sure, your theories were all wrong, but they led you to explore and find out new things." "Emma," I said, "is that the Karl Popper monster?" The presentations have a bit of animation missing from the PDFs. Feel free to employ anything you find useful for your own lectures, etc. 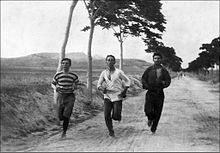 All images are public domain according to Wikipedia. Thanks to Bob Murphy for hosting. This task of home administration is not of uniform difficulty. Materfamilias will not mind who gets hold of the bread though she will exercise a general watchfulness against its being wasted, but when she has begun her first purchases of new potatoes for the year, she will be very careful to keep the dish under her own direct control and not let one of the children determine, at his own discretion, what is his proper share; for if she did there would be disproportionate gratification and disproportionate privation. 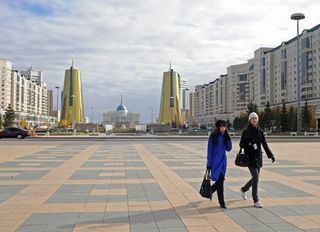 The above is a picture of Astana, Kazakhstan's new, rationalistically designed capital city. Just look at the life pouring across that central square! "It is therefore possible to undo the effects of historical circumstances, though the results in this paper indicate that this process can take several decades." So, in other words, we can "undo" the effects of historical circumstances with... a whole bunch of other historical circumstances! But of course, to the author, liberal, capitalist democracy is not a historical condition at all, but the logical pinnacle of human life. I recently was told about a conversation in which a Popperian assured his interlocutor that, "The only valid form of reasoning is deductive reasoning, so if someone says, 'I'm not using deductive reasoning,' that means they are admitting they are using invalid reasoning." Now, the first bit of stupidity present in this argument is that... not one bit of it is deductive! In other words, by the arguer's own argument, his argument is itself invalid. "Oh, I'm sorry," she said. "Is the name wrong as well?" I think we could have had a Wittgenstein moment if I had answered, "Yes, the name and affiliation are both wrong, but I'm still sure it's my badge." "By the way, according to the New York State seat belt law, Police/Fire and Ambulances (along with Taxis, Liveries, and Buses other than School Buses—I wonder what’s up with that) are exempt from having to wear seat belts. Again, control for you and me, but not for the State’s “chosen.” Or perhaps the State just doesn’t love police, firemen, EMTs, cabbies, and bus drivers as much as it loves us?" Perhaps David Kramer is unaware of this, but New York allows anyone, even LRC writers, to ride in buses, cabs, and livery vehicles. So, the "State's chosen" turns out to be... everyone! Hurray! In the latest issue of The Cato Journal, Richard L. Gordon reviewsThe New Holy Wars: Economic Religion vs. Environmental Religion in Contemporary America by Robert H. Nelson. He first asserts, contrary to the author of the book under review, that "Economic theory is not a religion..." In the very next paragraph he states, "The first is that economics is the only source of sensible appraisal of policies about the environment or other issues." The only source?! I'd say that's a view with which a fundamentalist of any flavour could sympathize. Sigh. Would there have been anything lost by using the word 'idea' in that sentence, instead of 'meme,' besides an air of trendy, pseudo-scientific mumbo-jumbo? Hold a Mirror Up to Rush Limbaugh and What Do You Get? "Sanchez and the Jets, though, were explosive enough to score 10 points in the last 2:46 and on the opening drive of OT." So they scored 10 points in the last 2:46 and another 10 on the opening drive of OT? That's a lot of points on one drive! "Detroit got off to a good start and led for much of the game, but couldn't make enough winning plays on both sides of the ball to snap New York's seven-game winning streak on the road." Not only could Detroit not make "enough" winning plays, they couldn't make any. Because, you know, if you make a winning play, you win. And they didn't win. What Are These Folks Doing? on procrastination and akrasia in The New Yorker.